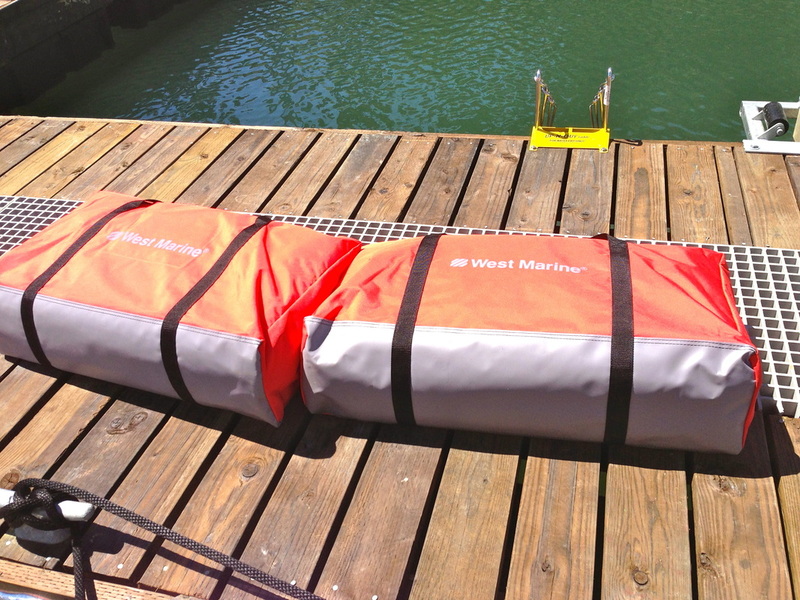 The theme is safety and convenience for the us and protection for the boat. We plan to minimize the movement around the foredeck and walking along the side rails. 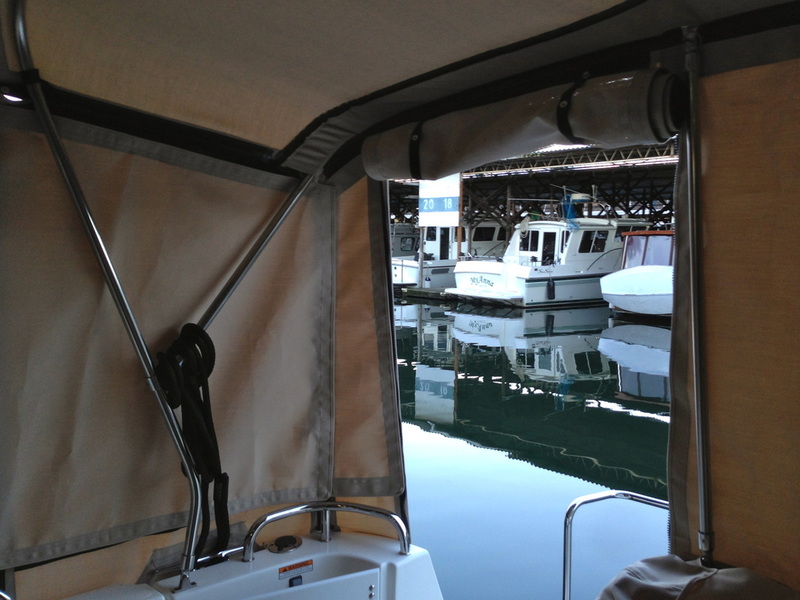 The Ranger 29 is safer to move along the portside side rails that many boats because it is wider, has easy grab rails and protective rails. 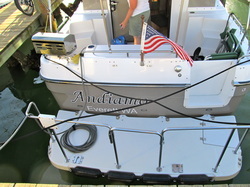 Andiamo has 6 fenders, three that are always secured on each side of the boat. We use black,Polyform G-5 fenders and fender lines and dock lines from Top Knot which we found were high quality, comes in a variety of colors and has loops that are pre-made. When the fender lines are hung from the top of the rail, they can be deployed and picked up from the window on the port side and the door on the starboard side. Secure the lines to the rail and the vertical stanchion by tying a clove hitch. Of all the knots to know, a boater really only has to know about 4 and the clove hitch is one of them. For the forward and mid-fender, split the knot between the stanchion and the line will not move along the rail. When the fenders are deployed, we deploy all of them because things happen, like wind and current, and plans can change quickly. Remember to keep those fenders fully inflated for maximum protection. They are easily filled with a pump that is used with the dinghy and the inflatable kayaks. 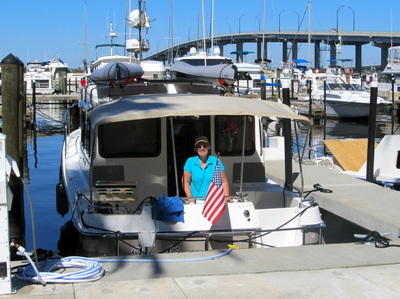 Andiamo has dedicated and secure bow and stern lines for both sides. The length of the bow lines are long enough to serve, most times, as both a bow line and a spring line to the mid-cleat. Two spring lines are kept stored when they are needed. MOORING LINE, TOWING BRIDLE & CHAIN SNUBBER. 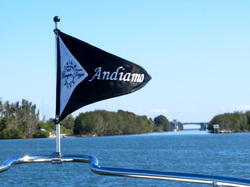 Andiamo is our 4th power boat and the 6th boat overall. 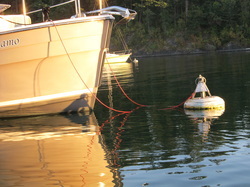 We prefer to use the mooring buoys in the state parks over docks and over anchoring. We have seen what a rough-edged mooring ring can do to a bow line that is threaded through one; the back-and-forth movement can cut right through a stout line. We use a dedicated mooring line where the ends have loops that secure to the anchor line cleat, the line threads through the deck chocks and in the middle of the line, on its own loop, is the largest stainless steel, spring closure, carabiner that we could find. 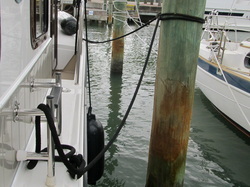 This photo is the mooring line used on a park buoy. 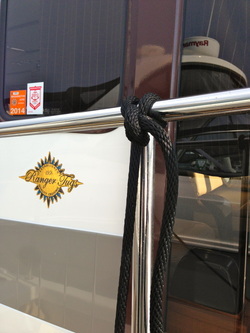 Using it is easy and safe: The boat's cockpit is put to the mooring buoy where the carabiner is easily clipped to the ring. The snap closure makes a quick and secure connection that is metal-on-metal. The the line is walked up to the bow and the boat's bow is put to the mooring buoy using the engine. The lines are placed in the chocks and the loops are secured to the cleat. We have used this mooring line to tow several boats. The Ranger Tug is a good towboat. Put the mooring line on the stern with the end loops on each side and around the two stern cleats, affix the tow rope to the carabiner and then the boat being towed is centered behind the tug and the strain is distributed between the two cleats. The mooring line becomes a chain snubber by adding a chain hook to the carabiner for shallow anchoring to provide some tension relief between the chain and the windlass. Simply, put the chain hook on the mooring line's carabiner, put the hook on a link of the chain, let out the rode until the chain hook is close to the water, tighten the mooring line and cleat it, and feed out a bit more chain and the rode's tension is transferred to the chain snubber for a quiet night. The stern lines need to be longer than what may be used on floating docks. These lines are cris-crossed and cleated. When the pilings are too spread long for the length of the tug, use this tactic to spring the tug away from the dock, while holding it in and keeping the opposite side of the tug away from those pilings. Using a clove hitch at the mid point of the line, keeps the line from slipping down the piling. Then, cleat the lines to the distance needed. Andiamo is frequently used to go to Hat Island, known as Gedney Island on the charts, which is 5 miles west of Everett, Washington. The cockpit is used to carry cargo as there is no commercial service to the island. 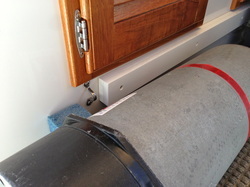 To protect the teak doors in the cockpit from dings and damage, a cleat made of starboard was added and two tie-down hooks made of stainless were thru-bolted to the fiberglass cabinet. We are scuba divers and the tanks and gear boxes are tied down to these. 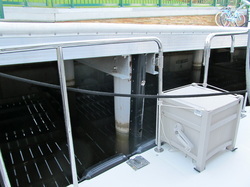 This is a photo of steel scuba tank lying down against the starboard cleat. 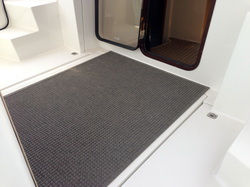 The factory supplied cockpit mat that covered the entire cockpit is of good quality but moving it frequently to get the storage areas and to open the engine hatch was inconvenient. The search was on for a high quality mat that would protect the gel coat and yet be a decent door mat. This mat is from L.L. Bean and fits the cockpit like it was custom designed. 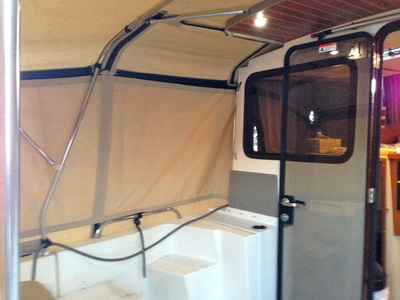 It covers only the engine hatch and can be easily rolled so the hatch can be opened. 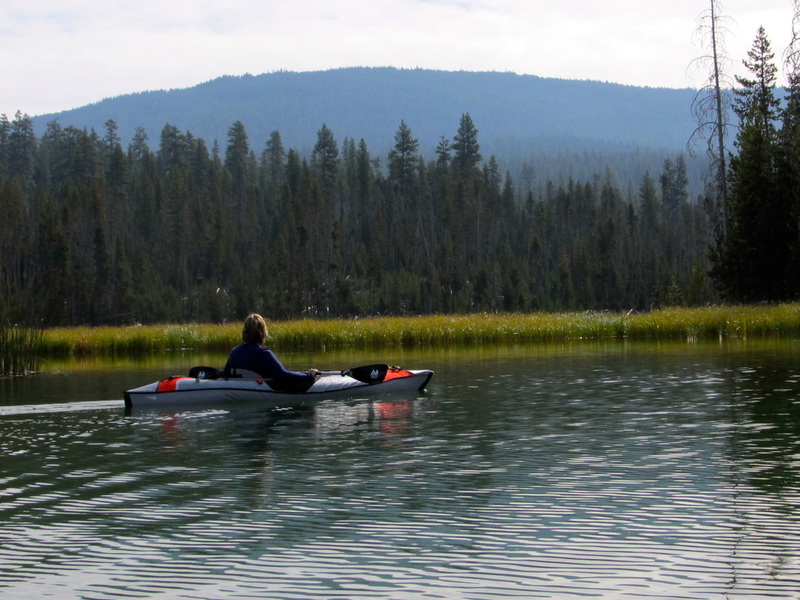 Kayaks are just plain fun and if there is not a dog that needs to go ashore and the distance you typically explore is within sight of the boat, then kayaks may serve the need of a dinghy. You will go places and see things that you would not see or go otherwise. 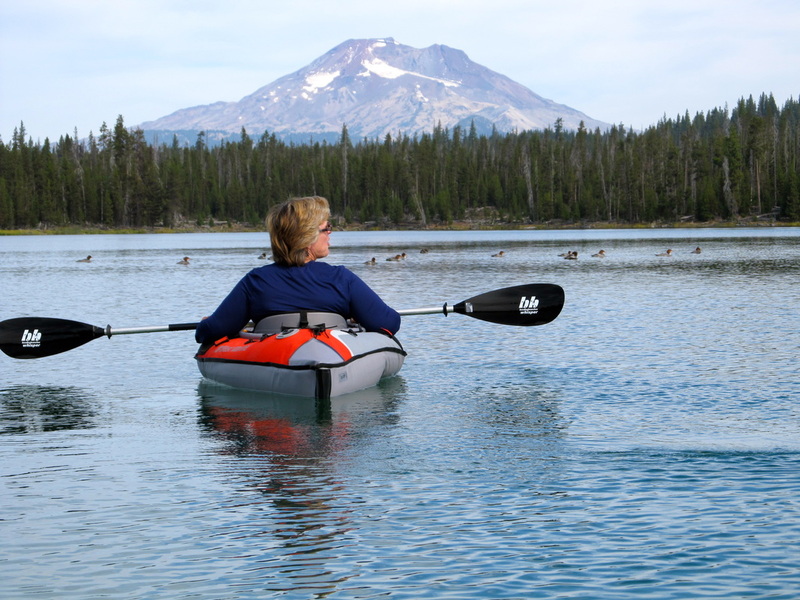 Andiamo has two single-person inflatable kayaks and these were made by Advanced Elements and sold by West Marine during their summer sale. 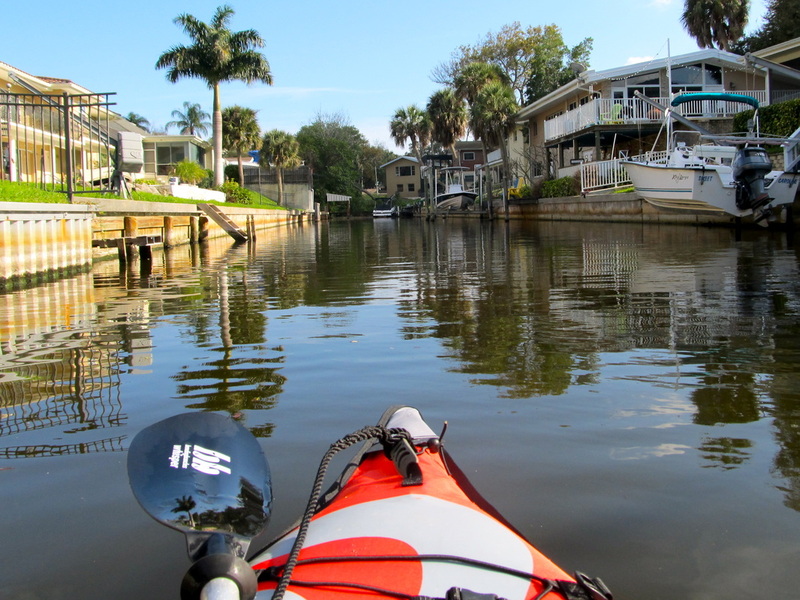 The paddles came from REI and the duo-action hand pump that came with the dinghy can inflate these kayaks in about 5 minutes on the foredeck. Weighing under 40 pounds, these are easily swung on on the roof and tied down in minutes on either side of the solar panel. The kayaks store nicely in these large suitcase-sized bags and make for easy storage. 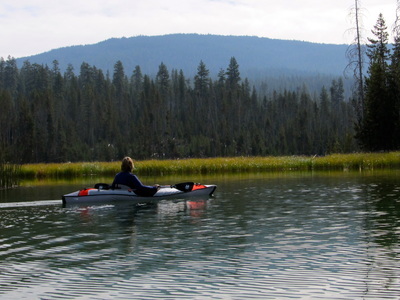 We also take them on our RV trips to explore lakes but the ones we have are NOT for rough water or white water craft. 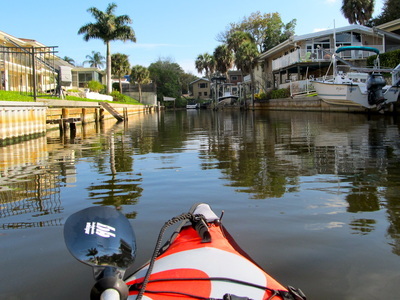 Bicycles and boating are a good match. Bikes widen the opportunities for exploration, creates some exercise, and are simply fun. 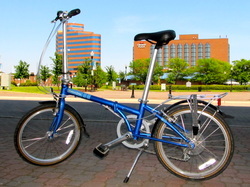 Folding bikes is the best of the both needs of use and storage. Our bikes are stored in custom-made canvas bags that our favorite canvas business, Leta's Top Shop in Arlington, Washington made for them. 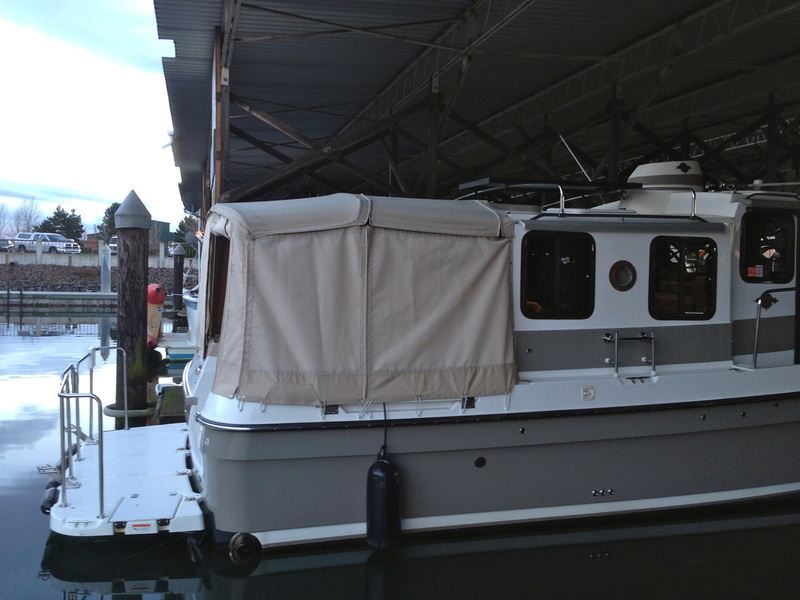 The bags are put up on Andiamo's roof and secured to the sports rack and kept in the mid-cabin berth. We are very happy with the Dahon Mariner bike because it is light, corrosion resistant and has a stout rack to carry stuff. The smaller wheels means that the bikes are not as fast as the full-sized ones. We call this 5-mile bikes. Which means they are great for one-way trips that are under 5 miles. They have enough gears to provide some ease of travel and they unfold quickly. We have done the moderately sized store provisioning runs on these bikes by using a backpack and two bike bags or panniers. Nearly a whole grocery cart can be put these when the packaging is removed. The panniers, bike tools and helmets all fit into an Action Packer box with a snap on lid. We also use these bikes every time we take our 19 foot Escape Trailer on a road trip because they nicely in their bags in the back of the truck, next to the kayaks and sometimes next to the dive gear. SAFETY GEAR. 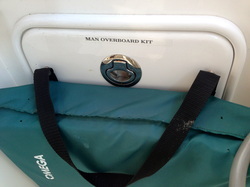 The factory-supplied trash receptacle in the cockpit was a great opportunity to store the Man-Overboard-Kit, An essential part of this kit is a throwable floatation device and these are mandated by the Coast Guard. We had learned from an onboard vessel inspection by the Coast Guard that the throwable device had to be readily accessible. The solution was to put two snaps in the strap and snap it to the door of the trash receptacle, now the Man Overboard Kit. The cushion is easy to get to and is off the floor of the cockpit. Open the latch of the kit and inside is rope bag in its orange bag that has a carabiner that snaps onto the cushion's strap. Throw the cushion and floating line pays out nicely. Under the rope bag are two 3-to-1 pulleys, one is jam cleat that is commonly used on sailboats. Color-coded, one pulley snaps to a strap that is slung through the grab bar that is part of the roof over the door, and the other pulley is connected to safety harness that is used by roofers and has wide nylon straps. 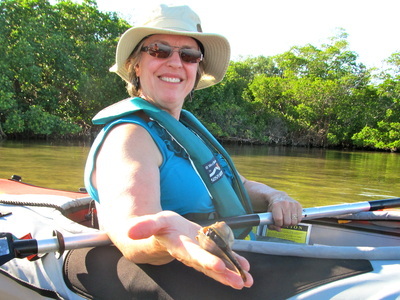 This pulley can also be snapped onto a life jacket. Our previous experience on the Great Loop showed that protection from sun and bugs was important to enjoy the cockpit. Protection from the rain was not a priority as the cabin is wonderful and heated. Leta's Top Shop in Arlington, Washington did the work for us. The bug screens are zippered to the top and sides and shock cord holds down the bottom. 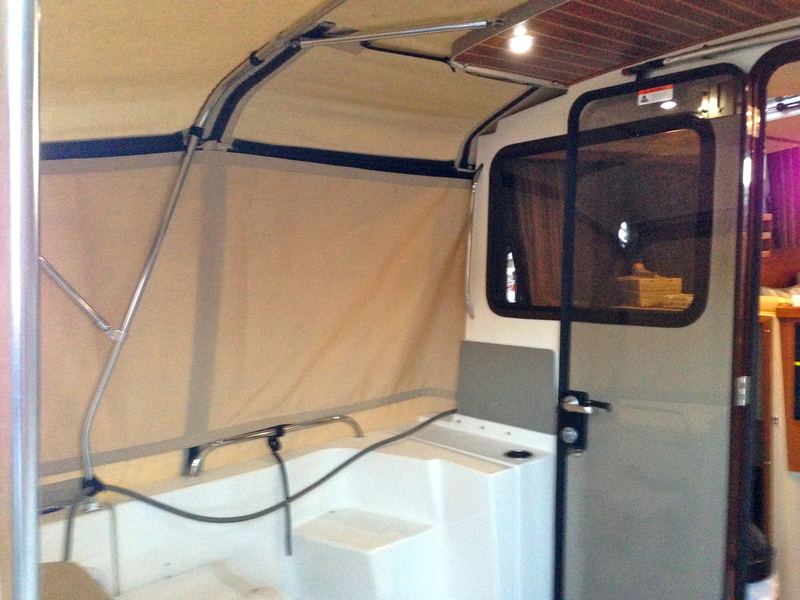 Canvas is attached to the inside by velcro for sun protection or privacy. The canvas panels were labeled with colored tape (red for port, green for starboard, yellow for stern) so they are easy to identity which panel goes where. All of these are stored in a duffel bag that is kept in the mid-cabin or in the starboard side cockpit. This hose-reel box came from a big box store and holds 400 feet of yellow, 3/8" floating line that is used to stern-tie the tug to the shore. This is a common strategy in tight anchorages. The box is kept in the cockpit and makes a nice table for wine and snacks and it serves as a functional step for those fixed docks where a step is needed. Special Requests or Instructions? What color of webbing? Notes: If you have a preference of Font, please let me know. If you have the graphics/picture of boat name please email or send.